. Mărţişor - Martisor (the amulet) - Romania . Not only on the Day of the Great Kanto Earthquake (September 01), but four times a year, including the first day of March, June and December.
. Sending off Water from Wakasa お水送り .
. Hina Doll Festival 雛祭り Hina Matsuri . were special festival days in Japan and China.
. Sangwacha　サングヮチャー Okinawa .
. keichitsu 啓蟄 awakening of hibernated insects .
. International Woman's Day .
. Kashima Shrine Festival 鹿島祭頭祭 .
. March Eleven 2011 in Japan .
. Kasuga Shrine Festival 春日祭 .
. Nirvana West wind 涅槃西風 .
. Fire-swinging festival at Aso Shrine Kyushu 火振り祭 .
. St. Patrick's Day - Ireland .
. shunbun 春分 vernal equinox, spring solstice .
. "Shrine Day" 社日 shanichi .
. Memorial Day for Saigyo Hoshi 西行忌　/ 西行法師 .
. World Tuberculosis Day .
. wind up mount Hira 比良八荒 Hira hakkoo .
. World Apitherapy Day .
. Walking through hot embers at Mt. Takao 高尾山の火渡り祭 .
. WKD : March - a Haiku Month .
. WKD : World Days in March .
. Ceremonies, festivals, rituals - March .
. Memorial Days of Famous People - March . we must differentiate between the "Haiku Season" and the natural phenomenon and human activites occuring at a certain season at a certain place. 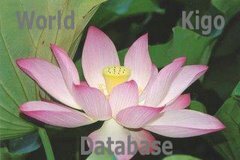 To complicate our endeavor, we also have to deal with the Asian Lunar Calendar and the 24 seasons (periods), which were applied in Japan before the introduction of the Western Calendar, when kigo were already used in Japanese poetry.
. The Japanese Haiku Calendar.
. WKD : the complete SAIJIKI list . This is a ritual to ward off paralysis from bleeding in the brain and other effects of bad health (chuuki 中気除け) and after a purifying fire ritual of chopsticks and Chinese bowls, food is served in these bowls. This ritual dates back to 1591, when Tokugawa Ieyasu passed here and was the first to eat from a purified rice bowl. After the food is eaten, pilgrims crawl under the legs of the large Nio-Statue to ward off evil for the next year. is a Buddhist temple located in the city of Matsudo in Chiba Prefecture, Japan. The temple was built by Chiba Yoritane in 1256, originally as a Shingon Buddhist temple named Dainichi-ji, but was renamed Manman-ji in 1312. Between 1532 and 1555 Takagi Tanetatsu, a regional leader, invited the Rinzai Zen priest Kinho from Daitoku-ji in Kyoto to the region. Over the next several years the area gained many adherents to Rinzai Zen, and Manman-ji became an important place of worship. 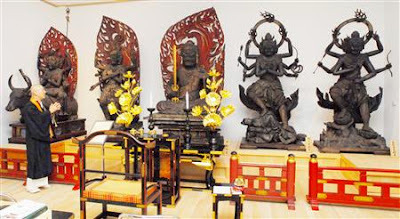 Manman-ji owns numerous examples of Buddhist statues of the Muromachi period. The temple is located along the old road from Edo to Mito (Mito Kaido 水戸街道). During the three days of the New Year celebrations and at the big temple festivals in Spring and Autumn it is possible to crawl under the legs of the Nio statues, which is another special ritual not seen in Japan. 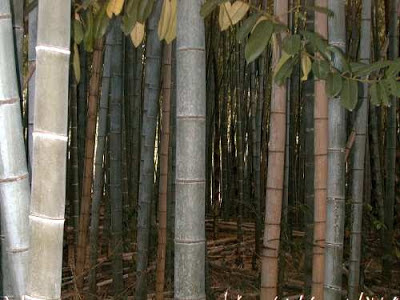 It will ward off evil influence and keep you healthy, especially in times of smallpox in the Edo period. It used to be a custom of local people, mostly bringing their sick children. But later it spread and even Daimyo lords came to perform this ritual.
. Fudo Myo-O 不動明王 Acala Vidyârâja .
. Mizukake Fudo 水掛不動明王 .
. Nio, Deva Kings 仁王 (Nioo, Niou) . ***** . Chawan ご飯茶碗 rice bowl . Oide matsuri 御出祭 (おいでまつり) "Departure Festival"
Keta taisha(気多大社 - Keta Big shrine) is the head shrine of Noto district, in Hakui Town, Ishikawa prefecture. The deity of this shrine is known as the god of love, and many young women come to wish for good love and marriage. Dedicated to Oanamuji no mikoto (大己貴命). Festivals of the shrine: U-matsuri, Hirakuni-matsuri. Many people have seen UFO flying from the back mountain of this shrine. 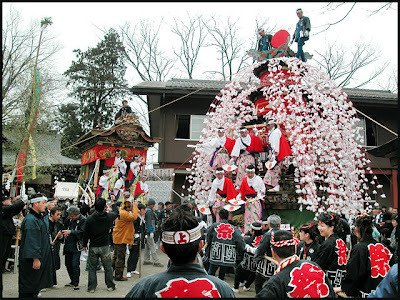 A shinkōsai 神幸祭 (processional festival) held from March 18 to 23 at Keta Jinja 気多神社, Hakui City 石川県羽咋市 , Ishikawa Prefecture. The festival name is also read heikokusai 平国祭. It is a rite that recollects the territorial pacification exploits of the saijin (main enshrined kami) Ōnamuchi no mikoto. A grand procession with a shinme (a horse upon which the kami rides 神馬) at the head makes a round trip from Keta Shrine to Ikukuni tamahiko Shrine 生国魂神社 in Nanao City, a trip of a hundred and several tens of kilometers lasting five nights and six days. 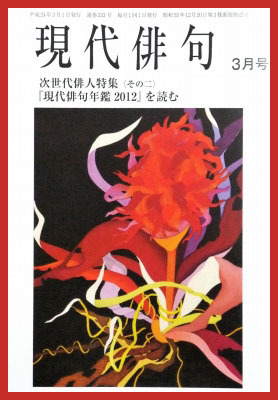 It is said that spring comes to the Noto region with this festival. Although in former times this used to be a rite in which a shin'yo (sacred palanquin) processed around the entire province, it is now limited to the counties of Hakui and Kajima. In the procession the shinme is in the lead, with long-handled scythes, shrine name flags, rice chests, standards, shishinboko (four-kami pikes, shishin no hoko シジンノホコ 四神矛), bows and arrows, kunimuke hiroboko (wide-bladed kunimuke halberds 広矛（ひろほこ）, and mounted priests in front and behind, protecting the shin'yo. On the first day it travels around the northern area of Hakui County, stopping at Takiya Shrine in Hakui Town. On the second day, the procession moves around the southern area and stops over night at the Inoyama Shrine in Inoyama Town. 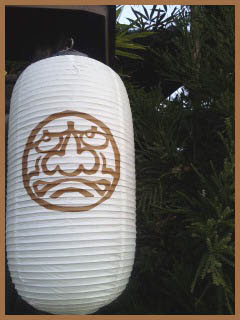 On the third day it enters Kajima District and proceeds to the Noto Ikukunitamahiko Shrine. 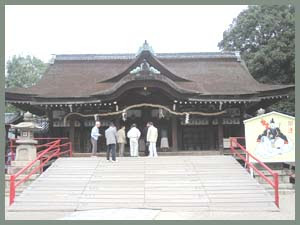 This is another name for Keta Jingū and is regarded as its original shrine. When the shin'yo enters the shrine the people who have been accompanying it raise a shout and pour into the shrine precincts (keidai). The mounted priests proceed into the grounds as well. However, in recent years, it is said that if they fall off their horses there will be an abundant harvest, so it has become quite wild. On the fourth day they begin their return journey from Nanao to Kajima County, stopping at Shirahiko Shrine in Toriya Town. On the fifth day they pass through the towns in the Noto area on their return to the main shrine (honsha). This is also called the oide matsuri (Departure Festival). The shin'yo is enshrined in the haiden (worship hall) until the Oisumi reisai (annual festival) on April 3. Another name for this (latter) festival is the Eye of the Snake Rite (Ja no me shinji) in which a snake eye target representing the great serpent that Ōnamuchi no mikoto vanquished is destroyed with long swords, halberds and bows and arrows. In addition to the main ritual observance, at present the priests merely wave and offer halberds to the kami. The rite is said to originate in the myth relating the occasion of Nagasunehiko's prevention of Emperor Jinmu's eastern movement over Ikoma Mountain during the latter's pacification campaign of the Yamato region. Formerly there was a ceremonial event in which participants went into the mountains in the evening to collect wood. Then they ran around striking the shrine buildings and the worship hall with the collected wood before returning home. In pre-modern times this occurred on February 1, but was abolished with the Meiji Resoration. It was revived in the seventh year of the Taishō era (1918), and since then has been observed on the present festival day. Cormorants are set free before the festival and if they came back to the shrine ground, they were captured and set free at the nearby beach again.
. Sukunahikona no mikoto 少彦名命 Sukuna Hikona, Sukuna-Hikona . These two deities held a comparison of their powers by trying to destroy a poisonous snake from the region. 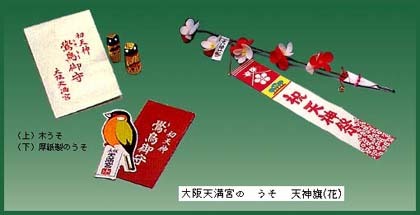 They used special weapons like sickles, which are in a tree trunk to our day.
. yakuyoke　厄除け amulet against evil . At shrine Tsunemochi Jinja 恒持神社 in Chichibu, Saitama. 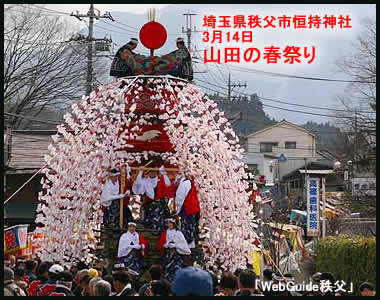 One "flower float (kasaboko 笠鉾) is pulled around the town. It is decorated with paper flowers. Three other festival floats (yatai 屋台) are also in the parade. When they reach the shrine, there are dance performances. The wheels of the floats are lubricated with green onion leaves, to remind people of the hard times when oil was not available. 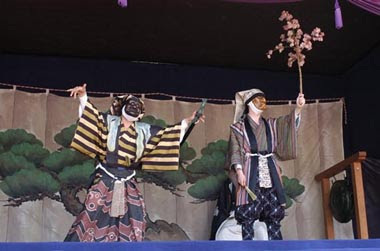 With a performance of Tsunemochi Shrine Kagura dance 恒持神社神楽. Children in colorful robes also perform traditional dances on the floats. At night, they are illuminated and fireworks held in the shrine compound. This festival is to ward off evil and prevent insects from harming the harvest for the coming year. The mountainous Chichibu region is famous for its many festivals. This is one of the larger ones and brings spring to the region. Tsunemochi Jinja 恒持神社 in Chichibu, Saitama. 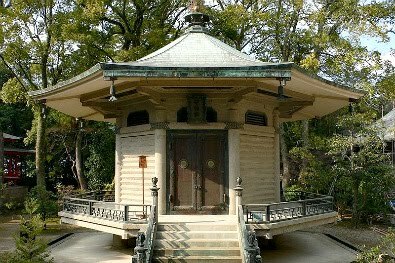 This present shrine was erected in 1908, when three local shrines were grouped together. It is also said to be in honor of prince Tsunemochi Oo 恒望王, brother of the famous Heike leader Takamochi Oo 高望王 (Taira no Takamochi 平高望) around 889. His office was at Araki 新木, now the shrine is located here. 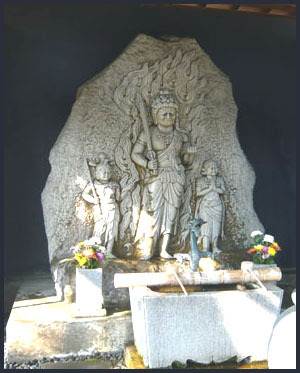 The deity in residence is a god of water 水の神, who provides water from the top of Mount Takashinoyama 高篠山. 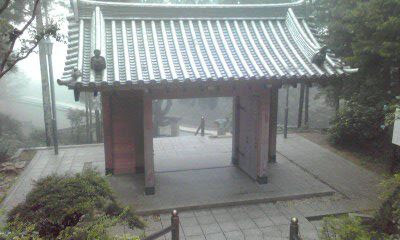 At the spring near the top of the mountain is the Dragon Shrine 竜神社 Ryuu jinja. the others were the Fujiwara, the Tachibana and the Minamoto. The Kammu Heishi line, founded in 889 by Taira no Takamochi (a great-grandson of the 50th Kammu tenno, reigned 781-806), proved to be the most strong and dominant line during the late Heian period with Taira no Kiyomori eventually forming the first samurai dominated government in the history of Japan. A great-grandson of Heishi Takamochi, Taira no Korihira, moved to Ise Province (now part of Mie Prefecture) and established a major daimyo dynasty.
. WKD : Taira no Kiyomori 平 清盛 . Near the top of Mount Rokko in Ashiya, Kobe, on Mount Maya, there is a small temple dedicated to Maya, Mother of Shakyamuni Buddha. 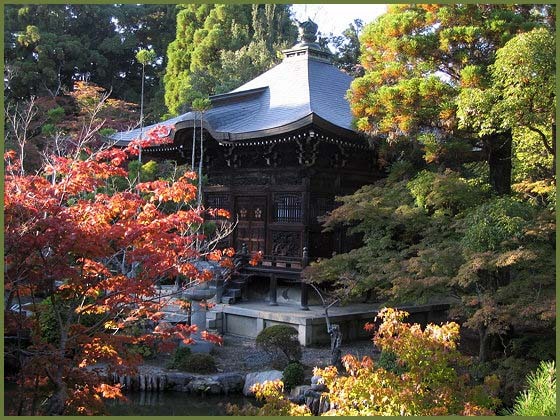 Tooriten is the name of a Buddhist paradise, where the deity Taishaku-Ten is in residence. one of the Mother of Shakyamuni Buddha 仏母摩耶夫人 (in the middle, below).
. . . CLICK here for Photos of Hodo Sennin ! "Mountain ascet with the emply begging bowl"
He came all the way from India, via Korea. Together with him came the deity Gozu Ten-o 牛頭天王 (Ox-head Deity), who is celebrated at Shrine Hiromine Jinja 広峰神社 in Hiroshima and during the Gion Festival in Kyoto. In former times, the local farmers around Mount Rokko 六甲山 came up here to the Maya temple ith their horses on the first day of the horse in the second lunar month and celebrated. Nowadays it is celebrated on the spring equinox day in March. People also came to pray for easy childbirth and health for the children and themselves. Maya is a guardian deity of women. As a speciality of this festival, konbu kelp on a string was sold. In former times it was transported on horseback. The sound of Maya is said to remind the people of the sound of uma (horse), hence the strong relationship. Maya-san is one of the highest peaks around Kobe (2,446ft), commanding superb views across Osaka Bay. The mountain is a sacred site for Japanese Buddhism, and is associated with Maya Bunin, Mother of The Buddha. During the Meiji Period, the temple here, also known as 'Moon Temple', housed a small figure of Maya Bunin said to have been made by Order of Wu Ti during the Liang Dynasty era of the 6th century. The sculpture was brought from China by Kobo Daishi. The annual festival of the Moon Temple took place during the 7th Day of the 7th Moon, an occasion during which the pilgrims ascended the mountain by night. Those taking part achieved the same merit as if they had made the ascent 48,000 times. Queen Māyā of Sakya (Māyādevī) was the birth mother of the historical Gautama Buddha, Siddhārtha of the Gautama gotra, and sister of Mahāpajāpatī Gotamī the first Buddhist nun ordained by the Buddha. "Māyā" means "illusion" or "enchantment" in Sanskrit and Pāli. Māyā is also called Mahāmāyā ("Great Māyā") and Māyādevī ("Queen, literally a female-deva, 'goddess,' Māyā"). In Tibetan she is called Gyutrulma. Queen Mayadevi was born in Devadaha kingdom of Nepal. Queen Māyā and King Suddhodhana did not have children for twenty years into their marriage. One day however, according to legend, Queen Māyā dreamt of a divine Bodhisattva on white elephant touching her side, and became pregnant. Māyā gave birth to Siddharta c. 563 BCE. The pregnancy lasted ten lunar months. Maya Devi was delighted by the park and gave birth standing while holding on to the branch of a sal branc. Legend has it that Prince Siddhārtha may have emerged from her right side. It was the eighth day of April. Some interpretations of the life story of the Buddha attribute his birth to a virgin birth.
. . . CLICK here for Photos of Japanese Maya Statues ! Domyoji Tenmangu Shrine originates in Haji Shrine that Haji Tribe built in 3 A.D. to enshrine their ancestor Amenohohi no mikoto (the son of Amaterasu Omikami, the goddess of the sun). 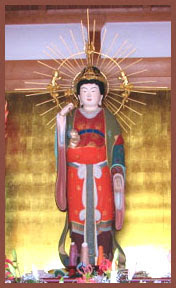 Sugawara no Michizane (enshrined as a deity of learning). The shrine possesses a lot of treasures including 6 National treasures, 2 Important National Properties, and 1 Prefectural Cultural Property. The halls were burnt down in the battles to capture Takaya Castle during the Warring States period, however the treasures were unaffected. Later the temple was given sanctuary to by Nobunaga Oda, Hideyoshi Toyotomi, and the Tokugawa Shogunate and designated as a vermilion-seal certificate land. Now people visit to pray for academic achievement, safe delivery, safe driving and so on. 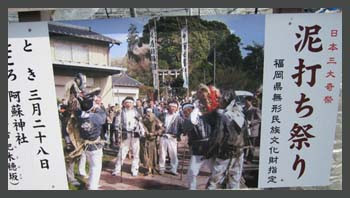 In 2002, “The 1100th Year Anniversary Festival” in memory of Sugawara no Michizane was held.
. Hajibe 土師部(はじべ) / 土部 Haji-Be clan . March 25, the memorial day of Sugawara Tenjin, is celebrated. The Heart Sutra (Hanya Shingyo) is read many times and visitors from far and wide recite with the priests. The Haji Clan 土師　used to have a nunnery here, later taken over by the Shingon school of Buddhism. The grandmother of Michizane, Kakuju-ni 覚寿尼, lived in this nunnary, and when he was put in exile in Kyushu, she put a plate of rice in the direction and said prayers for his wellbeing every day. After the ritual the rice was then eaten by the nuns who all were in good health. Thus the rumor of the miraculous qualities of the rice spread. Later the mochigome rice was watered for two days, then simmered and dried for 10 days and after that dried for 20 days near the fireplace. Then it was ground in a stone grinder and the powder is the "Domyoji flour" used for making mochi to our day. The mochi flour and all kinds of mochi rice dumplings is sold very well during the festival. (cold rice from) "Temple Domyo-Ji"
Here the name of the temple is used as a name for the food offering. Japanese confectionery consisting of a sweet pink mochi (rice cake) and red bean paste, covered with a leaf of sakura (cherry tree). On the 15th of January is the festival. 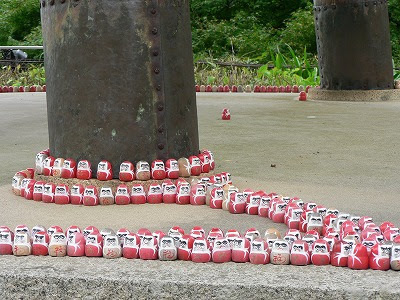 There were also three boxes, from Gold, Silver or Wood.
. usokae うそ替え exchanging bullfinches . It was distributed on the main festival in summer, on July 25.
. Osaka Folk Art - 大阪府　大阪市 . 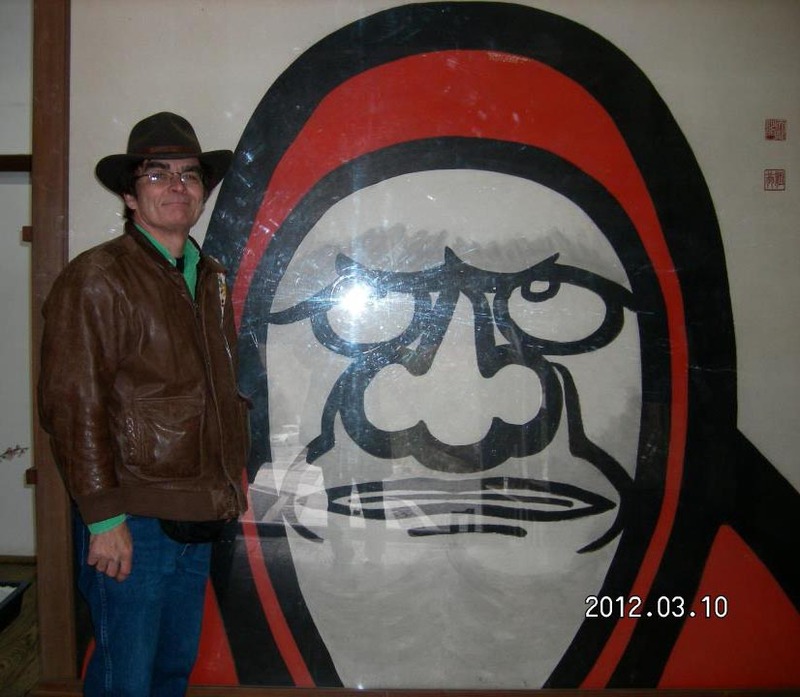 Domyoji stands in front of your mother's altar. Written in 延宝6年, Basho age 35. Here it is not the name of the temple, but the name of the cold rice food (hoshi-ii) prepared there. Ofter offering on the family altar, the cold water is used to prepare some Domyoji rice. May it cool off the soul on this hot summer day. Click on all thumbnails for many more photos ! This festival revolves around the Shinto shrine dedicated to Mount Aso in Kumamoto, where festivals with prayers for a good harvest are held every season. Aso-no-Ōkami 阿蘇大神, the kami or spirit who dwells at Aso Shrine has been worshipped from early times as the guardian deity of safety in navigation, and today, Aso-no-Ōkami is popular as a god protecting worshippers from traffic accidents and other untoward events. Yabusame is an annual festival which brings together horse-mounted archers, special arrows and targets, and Shinto ritual at Aso Shrine. 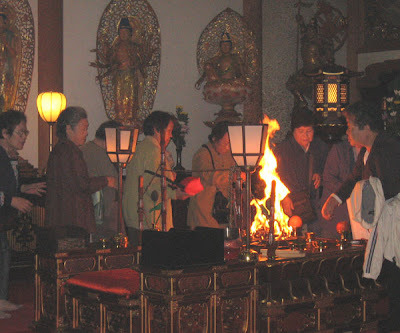 Aso jinja no Hifuri shinji (the fire ritual of Aso Shrine). Although rarely performed today, ceremonies which honor ancestors who settled near the Aso caldera do continue to be associated with the Aso jinja. Large ropes of about one meter length are made from kaya reedgrass, which are then bound to hemp ropes of two meters lenght. The reed grass is then set on fire and the rope wrung in a large circle around its holder, forming a circle of fire. With so many people participating in this ritual, the shrine looks like on fire itself or like a huge fireworks celebration. The origin of this ritual goes back to welcoming the god of the fields back in spring, to greet his wife (goze mukae 御前迎え(ごぜむかえ) . Read this entry for more information about this huge volcano mountain. 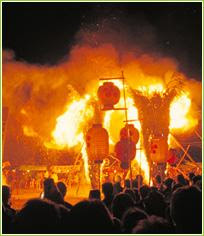 The onda matsuri for Aso Jinja in Ichinomiya Town, Aso County, Kumamoto Prefecture, occurs on July 28 and 29. As the otaue matsuri and the shinkō have been merged, the correct name for this festival is otaue shinkō shiki. 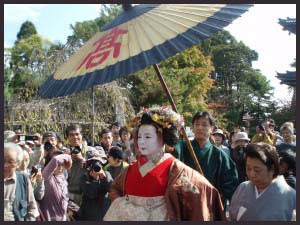 On the day of the festival, a procession of nearly one hundred attendants, beginning with a person wearing a mask of the kami, Sarutahiko, followed by saotome, fourteen unari (young women) carrying rice chests, lion dancers (shishi), dengaku, field laborers, oxen, and four sacred palanquins (shin'yo), proceeds to the first temporary shrine (ichi no angū ) and ceremonially present offerings of food (kensen) and norito. Then a ritual rice planting occurs and the procession moves to the second temporary shrine (ni no angū). In the evening, the procession returns to the main shrine (kangyo) where all of the shrines are ceremonially visited (miya mawari shiki), and another ritualized rice-planting is held in the shrine grounds (keidai). The Mud Throwing Festival is a unique festival held at Aso Shrine on March 28 of every year. People throw mud at a priest who acts as the god of rice fields in an attempt to foretell whether they will have a bountiful or lean harvest. 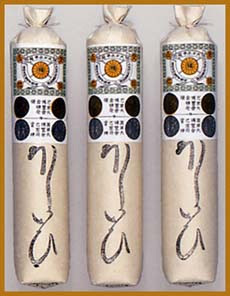 On the day of the festival, the priest (who is selected annually by lottery) changes into pure white shrine ritual robes and sits in a sacred area of the shrine grounds. After that, 12 children (parishioners) accompanying him simultaneously douse the priest in mud, and as he makes his way towards the traveler’s deity statue about 500 meters (1,640 feet) away, people grab mud that is prepared along the route and throw it at him. It is said that the more mud sticks to his body, the more bountiful the year’s harvest will be! 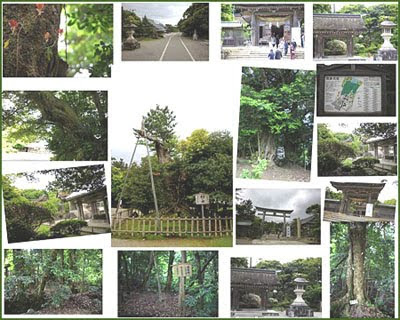 Kumamoto Prefecture--Asojinja shrine here said it will need 10 years and 2 billion yen ($18.65 million) to restore buildings and facilities, including culturally important properties, that were damaged or destroyed in the recent earthquakes. The shrine will set up a support group and collect donations for the reconstruction project. According to shrine officials, the “romon” two-storied gate, a government-designated important cultural property, was destroyed in the magnitude-7.3 earthquake on April 16. 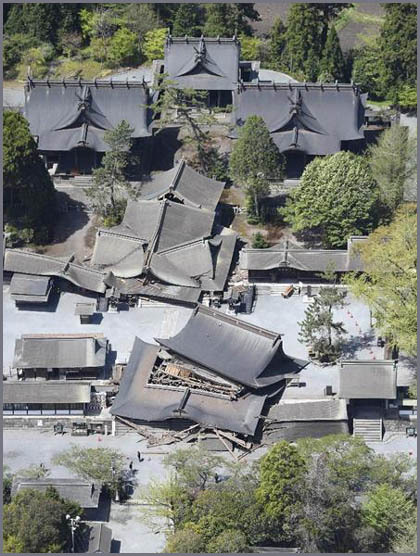 The shrine’s three main halls, as well as the Miyukimon and Kangyomon gates, all of which are also listed as important cultural properties, were severely damaged. Saga is an area in Kyoto, Arashiyama Saikyo-ku district. There are many large temples in the area, which was used by the courtiers as a retreat after leaving politics.
. Tenryuuji 天竜寺 - 天龍寺 Temple Tenryu-Ji . - Shared by Charlie Smith at Kyoto. Many festivals of these temples are kigo. was the 52nd emperor of Japan, according to the traditional order of succession. His reign spanned the years from 809 through 823. Saga was a scholar of the Chinese classics. He was also a renowned as a skillful calligrapher. he was the first Japanese emperor to drink tea. Emperor Saga Tenno played an important role as a stalwart supporter of the Buddhist monk Kūkai Kobo Daishi. 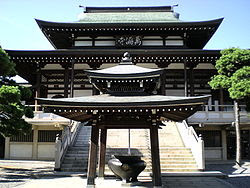 The emperor helped Kūkai to establish the Shingon School of Buddhism by granting him the Toji temple in the capital Heian-kyō (present day Kyoto). Saga's grandson, Minamoto no Tōru, is thought to be an inspiration for the protagonist of the novel The Tale of Genji. In ancient Japan, there were four noble clans, the Gempeitōkitsu (源平藤橘). One of these clans, the Minamoto clan are also known as Genji (源氏), and of these, the Saga Genji (嵯峨源氏) are descended from 52nd emperor Saga.
. Saga Tenno 嵯峨天皇 and 弘法大師空海 Kukai Legends . 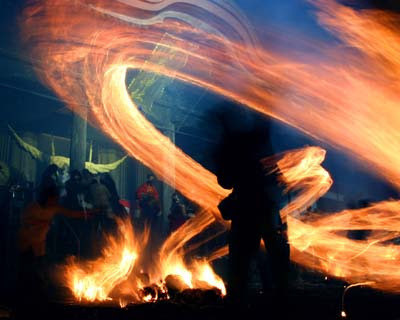 At about seven thirty at night, three torches of about seven meters length and 1.5 meters diameter are lit. From the power of the flames the good fortune and harvest of the coming year is divined. One of the three famous fire festivals of Kyoto. One of the three most important prayer kyogen performances at the Shakado hall of temple Seiryo-Ji. This prayer ceremony is held in spring and autumn, but the spring one is the kigo. It used to be on march 15, but now it is held for two days on a saturday and sunday in mid-april. It was started by saint Engaku at temple Mibudera (Mibu Nenbutsu) in the year 1279., who prayed to see his deceased mother again. It is now an intangible cultural folk property. Like in the Mibu Nenbutsu, there are no words, but only the sound of the gong "kanden kanden" and the big drum. It is really quite a rural dance performance of Old Saga. Originally the masks from the Shakado Kyogen were produced from papermachee and sold at the temple as amulets for the visitors. This custom was abolished during the Meiji period. Now it has been picked up again by Fujiwara Fuseki 藤原孚石. His son and grandson are now producing these simple, but charming masks. 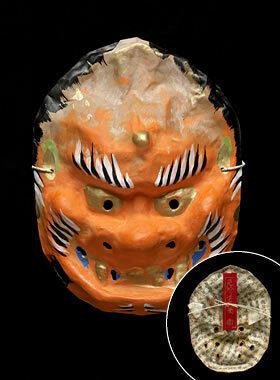 They are made by plastering washi paper into the mold, then taking the mask out and coloring it. This is now the job of the second generation Fuseki. His son still has to learn how to plaster the masks. The paper is taken from old books, since this is the strongest washi. He uses pages with Hiragana for female masks and pages with Kanji for male masks. There are now about 30 different kinds made by the Fujiware family.
. 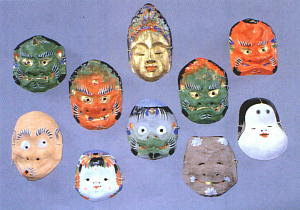 Masks from Japan . with tofu from Saga 嵯峨豆腐. Sagadoofu is the starting point of Kyoto Tofu, with its beans from the Saga plain and fresh water from the nearby forests. Made by the shop Morika 森嘉（もりか）near Shakado Hall (Seiryo-ji Temple). 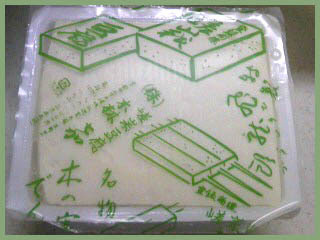 It is made with sumashi-ko すまし粉）, sekko, a kind of calcium sulfate instead of nigari. This dates back to a time after the war when they could not get any real nigari and had to find a substitute. The store uses only the old equipment and all is made by hand. Only a small amount of this tofu is made every day for sale. Kawabata Yasunari was fond of this hard tofu. In a prescript to this haiku, Kobayashi Issa alludes to a statue of Gautama Buddha being returned to its temple in Kyoto. Seiryooji 清涼寺 Temple Seiryo-Ji in Saga, Kyoto, is quite famous for the sandalwood statue of Gautama Shakyamuni which is about 160 cm high and rather simple in a robe of Indian style of Gandhara Buddhas. It was made in China and had the intestines made of silk inside. 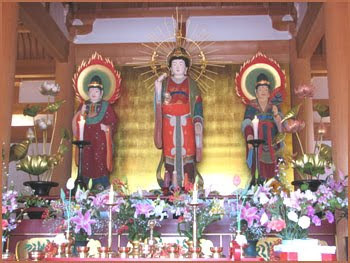 The statue had been shown at the temple Eko-In 回向院 (Ekooin) in Edo in 1810. 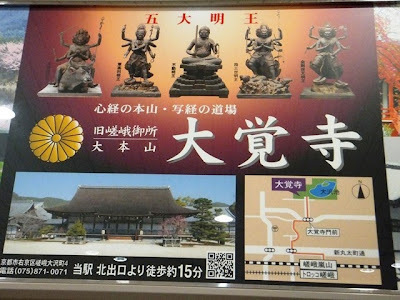 By using the expression sude ni Issa shows us that the Buddha statue is already back home, while he is still in Edo, trying to get his inheritage, to get back under his own sky in Shinano. 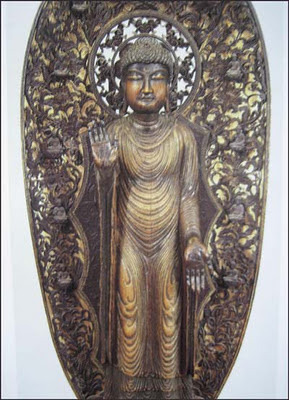 In 538 the very first Buddha image to arrive in Japan was a statue of Shakyamuni presented as a gift by a Korean king. ... in 1249 the priest Eison ordered a copy of the Seiryoji Shaka and installed it as the principal object of worship at the large Saidaiji temple in Nara. ... The Seiryoji Shaka is still shown on the 8th of each month.
. Tainai Butsu 胎内佛, 胎内仏 statue within the statue . Die Verkörperung des Prinzen Shakyamuni Gautama (um 550 - 480), geboren in Kapila, Indien, der als Mensch tatsächlich gelebt, die Erleuchtung erlangt und diese Lehre dann verbreitet hat. Als Figuren des Religionsgründers waren Shaka-Statuen in der Asuka-Zeit in Japan zunächst besonders beliebt. 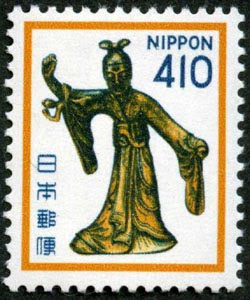 Älteste Statuen in Indien aus Gandhara und Madura, um 100 v.Chr., in Japan aus der Asuka-Zeit, z.B. Shaka-Statue des Udenoo des Tempels Seiryooji in Kyooto mit fast noch indischem Faltenwurf. König Udayana (Udenoo, Utenoo) von Kausambii in Indien war ein Gläubiger, dessen Leben im Sutra Zooitsu Agonkyoo beschrieben wird. Nachdem Shakyamuni in den Tushita-Himmel einging, wurde der König sehr krank. Seine Minister waren sehr besorgt und fertigten einen Buddhastatue aus Sandelholz; daraufhin wurde der König wieder gesund. Diese Statue, angeblich die erste Buddhastatue überhaupt, heißt auch "Glückverheißender Shaka" (Zuizoo Shaka). Der japanische Priester Choonen ließ eine Kopie dieser Statue anfertigen und brachte diese "durch drei Länder" (Indien, China, Japan) gewanderte Figur mit nach Japan (sangoku denrai). Diese Kopie existiert heute noch im Tempel Seiryooji in Saga, Kyoto. Figuren in diesem fremdartig anmutenden Stil werden Seiryoo-Figuren (Seiryooshiki) oder Saga-Figuren (Sagashiki) genannt. Die Haare des Shaka sind dabei wie ein dicker Zopf um den Kopf gerollt. Diese Statuen waren in der Kamakura-Zeit sehr beliebt; es soll insgesamt in den großen Tempeln des Landes über 100 Stück davon gegeben haben. Udenoo ist auch bekannt als einer der Gefährten des Monju in der Monju-Fünfergruppe. 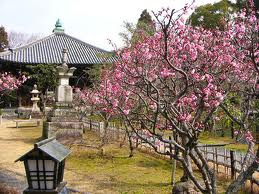 Temple Seiryo-Ji is famous for the plum blossoms and early red momiji leaves.
. Yuugiri Ki 夕霧忌 Yugiri Memorial Day . A memorial service for Yugiri Tayu is held every November at Seiryoji Temple. She was a high-ranking courtesan at the Shimabara quarters in Kyoto. 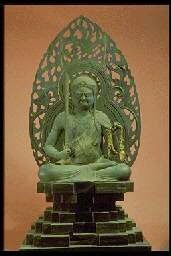 A statue of Amida Nyorai is shown and special prayer chantings (insei nenbutsu 引声念仏) performed. The statue is then clensed with a white cloth dipped in fragrant water. This white cloth, when used to cover a dead body, makes sure the soul will go straight to Buddha's paradise in the West. This ritual is in memory of the Mother of Anki Monin 安喜門院 (1207 - 1286), wife of Emperor Gohorikawa Tenno 後堀河天皇.
. OBSERVANCES – SPRING SAIJIKI . Ritual cleaning (Ominugui) of statues is also done at other tempels at other times.
. Dainichi Nyorai 大日如来 . Daikaku-ji is a Shingon temple dating from the Heian period. It is famous for moon-viewing boat cruises on Lake Ōsawa. Shakyō (sutra transcription) lessons are held daily at the temple. Daikaku-ji was founded in 876 by Empress Masako (810-879) on the site of the Saga-rikyū, a country villa built for her father, Emperor Saga Tenno (786-842). The temple kept a close relation with the Imperial family, and was actually a monzeki (門跡), i.e. a temple whose appointed abbot was an Imperial prince. In the early 14th century, retired Emperor Go-Uda (1267-1324) conducted his cloistered rule from Daikaku-ji. 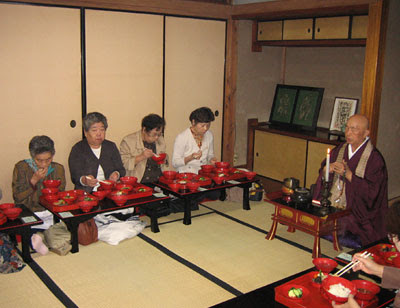 A school of ikebana named after the emepror, the Saga Goryū, is still based in the temple. The Shin-den Hall (宸殿) was transported from its original location in the Imperial Palace in the 16th century. It contains some valuable fusuma screens attributed to the Sengoku-period Kanō school, the most famous schools of Japanese painting. There are moonviewing parties on boat on the Osawa pond. 五大堂, now in the Museum of the temple. Acala Vidyârâja - Vidyaraja . three on top, five in the middle and 7 near the bottom. Also some withered leaves near the ground - and all this at the same time. It is a secret to study how to grow them - only at this temple. Basho was staying at the home of Yamei 野明亭, a friend of Kyorai.
. Sakai Yamei (1662-1713) .
. Mukai Kyorai 向井去来 .
. "capital of blossoms", hana no miyako 花の都 .
. Arashiyama 嵐山 Storm Mountain .